Who doesn't love a grilled cheese sandwich? It's super quick and easy to make and, above all, absolutely delicious, making it the go-to meal for busy parents who need to whip something up in a pinch. Cheese and bread taste great together, but they're also the perfect foundation to build a handcrafted, gourmet sandwich upon. Next time you make grilled cheese for your little one, use the simple recipe below but don't forget to make one for yourself. Just be sure to unleash your creativity and culinary potential. Make a simpler grilled cheese for your toddler! Spread a layer of butter or margarine on one side of each piece of bread. When the pan is hot, place a slice of bread — buttered side down — into the skillet and then place the cheese on the bread. Top with the other slice of bread, buttered side up. Flip the sandwich with a spatula after it turns golden brown, usually after about 2 minutes. Cook for another 1-2 minutes. Use a pizza cutter, knife or kitchen shears to cut the sandwich into bite-sized pieces for your toddler. You can use any type of cheese that melts easily and you can add thinly sliced or grated veggies or lunch meat to the sandwich to add more nutritional value. Use a cast iron skillet. Everything tastes better when cooked in cast iron, and you'll notice a difference. Thoroughly coat the entire surface of the bread with butter, olive oil, etc. so it cooks evenly. Be patient. Keep the heat low so the bread turns golden brown and the cheese melts perfectly. 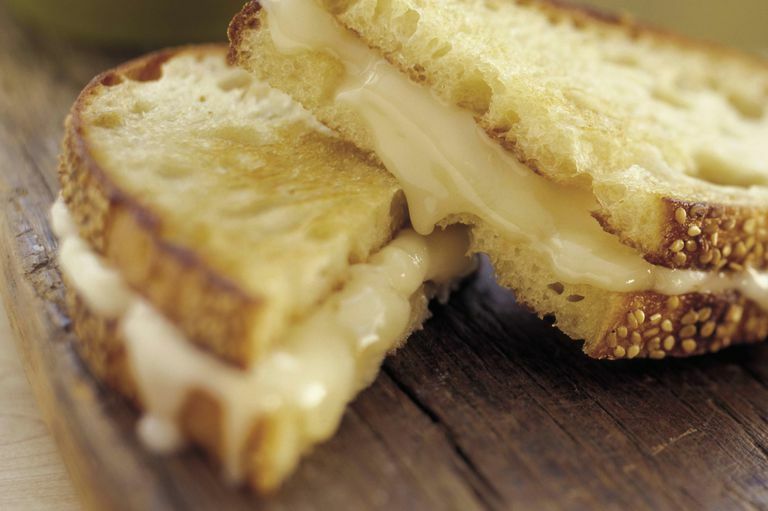 Consider your cheese-to-bread ratio to avoid biting into a chunk of just bread. A sandwich made with two thick, hearty slices of whole grain bread will probably require more cheese than one made with thin slices of white bread. Grated cheese melts faster than slices of cheese. Be creative. A basic grilled cheese is delicious, but it's also the foundation for the sandwich of your dreams. Instead of American cheese, try mozzarella or gruyere. Instead of white bread, opt for pita. Brown the bread in a small skillet and cook the sandwich open-faced in the oven at 400 degrees so the cheese turns brown and bubbles. Put the two slices together and you have a delicious oven-baked grilled cheese.